Wash & dry coriander leaves in shade. Chop the coriander leaves finely & take them into a plate. Remove coconut from the shell & cut into small pieces. Using a mixer grinder grind the coconut pieces to get grated coconut. To get smooth textured chutney the coconut needs to be soft. So add some water (40ml) to the grated coconut & grind coarsely. Measure 95gms (3/4Cup) of the coarsely ground coconut and take it into a bowl. The texture of the grated coconut varies when coconut is grated using the traditional coconut grater which has sharp spikes or a scraper or coconut grated using a mixer grinder. Break red chilies into small pieces. Similarly break green chilies also into small pieces and keep them aside. Heat a pan and add oil to it. When the oil is hot add black gram and fenugreek seeds. Fry stirring on low flame till the seeds change color to light brown. Then add mustard seeds and fry till they crackle. Then add green chili pieces, asafoetida and mix well. Add red chili pieces and fry. Take these fried items into a mixie jar. To the remaining oil add the coriander leaves and fry stirring till moisture evaporates and coriander wilts. Add tamarind, turmeric powder and salt to the fried items and grind them. While grinding mix/push with a spoon in between and grind. The paste/powder should not be finely ground. At the same time the paste/powder should not be too coarse. Grind till the seeds are crushed. Then add the fried coriander leaves and grind using the pulse button so that it will get mixed with the masala without becoming a paste. The kottimeera karam or coriander chutney is ready. Serve this with plain rice. To prepare kottimeera kobbari karam, add the ground coconut to the coriander chutney and mix well. The prepared kottimeera kobbari karam or coriander-coconut chutney is ready to serve. Serve this chutney with plain rice d ghee. 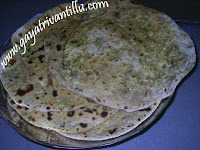 Spread this chutney on a roti or a paratha, roll it and serve in lunch boxes. Coriander leaves shrink after frying in oil. So it is advisable to fry coriander leaves first and then judge as to how many chilies you require. 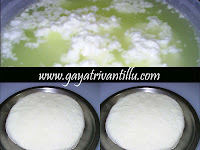 The texture & taste of the chutney differs with the type of grated coconut used---using a coconut grater gives a new texture & taste when compared to the scraped coconut mixed chutney or chutney prepared with coconut grated in a mixer grinder. Do not grind the seasoning to paste adding water—coarse texture gives the taste of stone ground chutney. Adding coconut gives a delicious taste to the chutney. Serve spreading this chutney on rotis, parathas & roll. 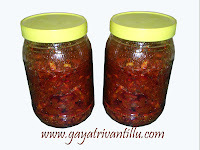 This chutney can be had with rice & ghee or can be served with dosas too. Mee recipes chala detailed ga unnayi. Pootharekula preparation details and info u gave was very good. Asalu inni paatlu untaayi ani kuda teliyadu. Yivaala mee kobbari-kothemeera pachadi chesanu. Chaala baaga occhindi. Amma chesina rotilo pacchidi laaga undi. US lo as working mom and being vegetarian, bayata tillu ekkuva nacchavu. Mee site and utube lo videos chaala informative and detailed ga unnayi. Sophisticated and ardham kaani utensils and kitchen aids vaadakunda, andari vantintlo unde vaatitho chaala baaga chepparu. Hats off to you and keep more of them coming! Hello gayathri garu...B.tech ayyina ventaney pelli ayyipoyina naaku assalu vanta gurinchi avagaahana ledhu, Uk ki vachina ventaney...emi cheyyalo ardham kani paristithi....alanti appudu mee videos chala help chesayi....assalu vantey raani naaku chaala baaga vanta chestunnav ani compliments vastunnai.....mee vantalanni acchu ma intlo vantalu﻿ laga vuntayi....Thanks so much.... intaki na doubt enti antey.. ee recipe ki dessicated coconut vadacha? Thanks for your feedback. You need to use only fresh coconut for﻿ this recipe.